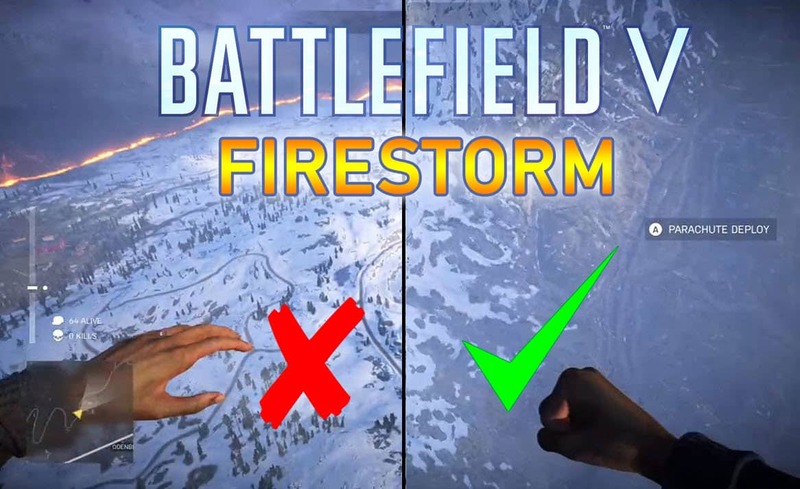 Battlefield V Firestorm can have a steep learning curve if you haven’t played previous Battlefield games. To get a head of the competition, you’ll want to learn a few tips and tricks in Firestorm. One of the most important tricks is how to glide faster in Firestorm. EA Dice has introduced Battlefield V Firestorm to the world. 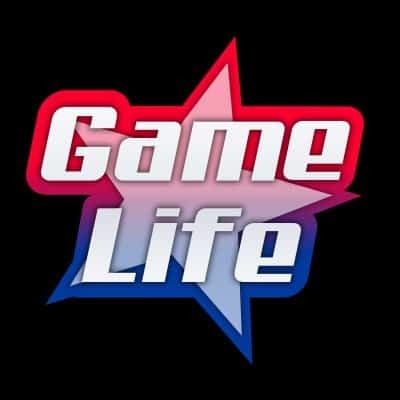 It’s a battle royale game that takes place during World War II. The mechanics, movement, and setting is completely different that other battle royale games. For those who have never played Battlefield games before will have a steep learning curve. From firing weapons to the way you move, it can be a lot to handle. Now with the Firestorm making it onto the scene, it just adds to the amount of learning required to master the game. However, one important item to master before anything is the Firestorm drop. Mastering this is pivotal to your survival in-game, and gives you a better chance of making it out a live. At the start of every Firestorm match, players find themselves inside a Junkers Ju 52. The plane starts to fly into the circle and then enables players to drop from the plane into the field. As players choose their locations on the map, they drop down to land on the ground and then quickly enter a building to find weapons. However, there’s many times when other players land in your area, and get to your spot way before you do. Even though you might think you’ve deployed from the plane faster than anyone else, how is it possible that they landed in your location first? There’s a strategy behind gliding faster in Firestorm. 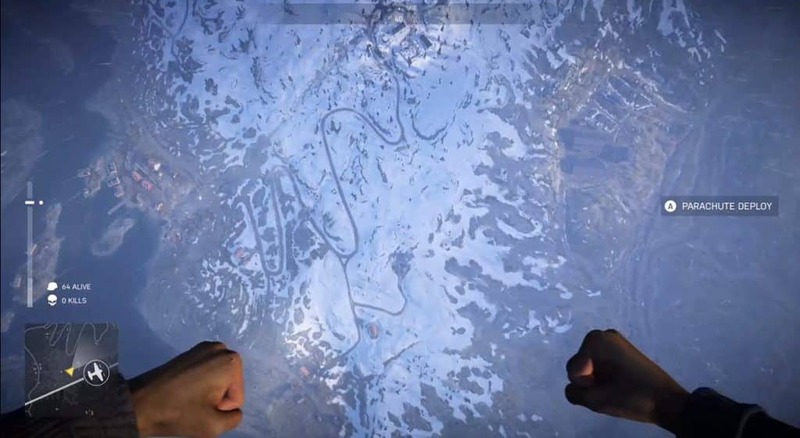 One user submitted a video of how they glide faster in Firestorm below. Players are given a 5 second delay before they are able to drop. This is enough time for the player to look around the map and choose a location point. Knowing that the Halvoy map in Firestorm changes all the time, players need to be familiar with the best loot spots in Firestorm. Once a spot is chosen, you’ll want to deploy just before the spot, no directly above it. The Reason for this is that when players deploy, the fly down diagonally, not straight down. Gliding towards your chosen location from a short distance will allow you to reach your spot head first. If you deploy your parachute and then need to maneuver across the map, you’re slowing down and loosing precious time. As shown in the video, the location point if just outside the Dig site. The player deploys and glides looking down for optimal speed. Notice in the video that the players hands are clenched. When they are clenched, that means you’re gliding down as fast as possible. When the hands are opened (as shown in the video), your player slows down. This is never a good idea unless you’ve realized that other enemies glided to your location spot faster than you. This way you’ll need to adjust your speed and change directions. While gliding to your location, the same concept in all battle royale games apply. To properly glide faster in Firestorm to your chosen location, you need to glide looking down, and then look forward, repeating this process till you’re in good distance of your target spot. More: Shroud Gives Harsh Review of Battlefield V Firestorm. 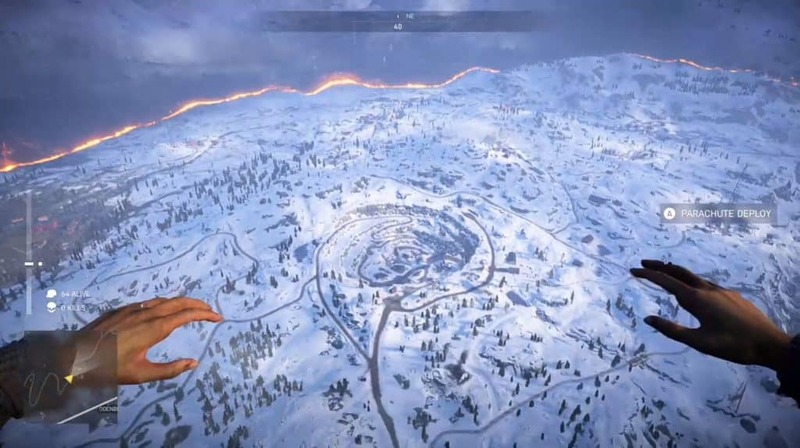 Another trick in Firestorm is once the parachute deploys, not to lose too much ground or over drop, you’ll want to swing your parachute left and right which allows the player to land evenly on his target destination as demonstrated in the video above. Being able to glide faster in Firestorm properly will be the difference between picking up weapons to fend of enemies, or getting eliminated and going back to the menu screen. The key point in gliding in Firestorm is to deploy from the Junkers JU 52 at the right moment. Once you master that, you’ll be able to glide down using the techniques above.